The BallyCara Wellness Program offers a wide range of personalised activities to help people live happier and healthier lives. Developed and delivered by a team of qualified health professionals, the BallyCara Wellness Program promotes optimal physical, mental and emotional wellbeing. Individual Exercise Physiology sessions available to provide one to one support with your choice of Exercise Physiologist. 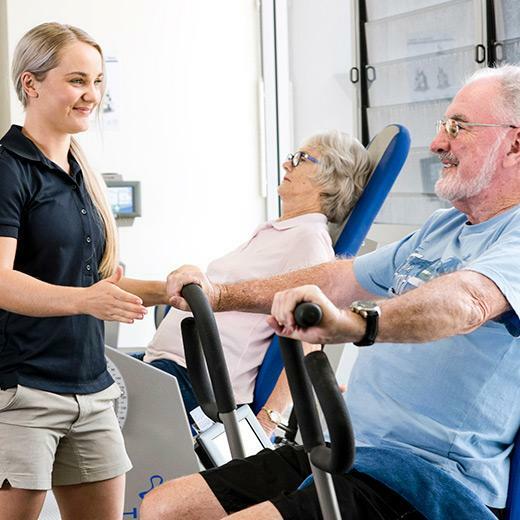 We are also registered to provide fully subsidised individual sessions through Medicare, Department of Veteran’s Affair and Private Health Insurance providers. Book in for a fully supervised gym session led by one of our Exercise Physiologists. Be led through a comprehensive workout incorporating free weights, resistance bands and the adjoining Wellness Gym equipment under the expert instruction of one of our qualified Wellness Staff. Have new found confidence by challenging and improving your balance, coordination and mobility. A fun 45 minute session led by one of our qualified Wellness Staff, focusing on the four building blocks of seniors’ fitness—aerobic training, resistance training, flexibility and balance. Discover this worldwide phenomenon—an exhilarating , easy to follow and calorie burning dance-fitness class. Improve your fitness, strength and core stability in this low impact exercise session. Join Lisa in this popular session focusing on balance and strength at a gentle pace. A short (40mins) balance, stretching and resistance class led by one of our Wellness Staff. A gentle way to fight stress. Tai chi helps reduce stress and anxiety. And it also helps increase flexibility and balance. DVA and Medicare clients accepted.